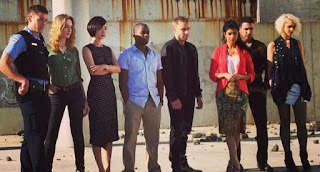 I think this episode is trying to do something good, I don't know how much it succeeds. There's serious stuff amongst the levity again I'm afraid. 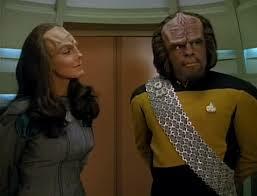 Troi is counselling a recent widow who is proud (even smug) about keeping herself busy and positive. 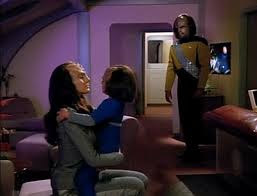 Troi points out that she's avoiding her feelings and gets her to express her grief. 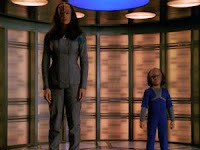 Troi has a headache and goes a little blank as her patient is leaving. On the Bridge Worf momentarily thinks he detects something, then same thing happens to Data. When they try to move the ship stalls, and it turns out they're being dragged through space by something. Any attempts to move away make the ship judder. As the headache worsens Troi calls Crusher about it, but sickbay is busy with those injured by the stalling starship. 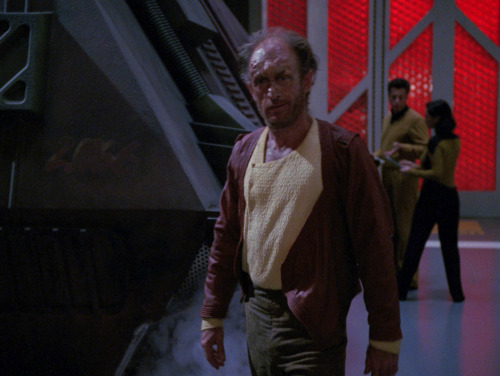 Crusher tries to help Troi, and suggests she rests, but a senior staff meeting is called and even though Troi feels foggy they both go. 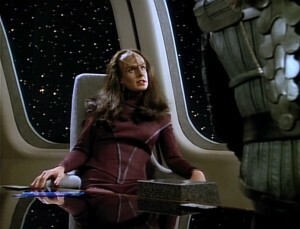 In the meeting Troi realises that not only can't she sense anything outside, she cant sense anything at all. 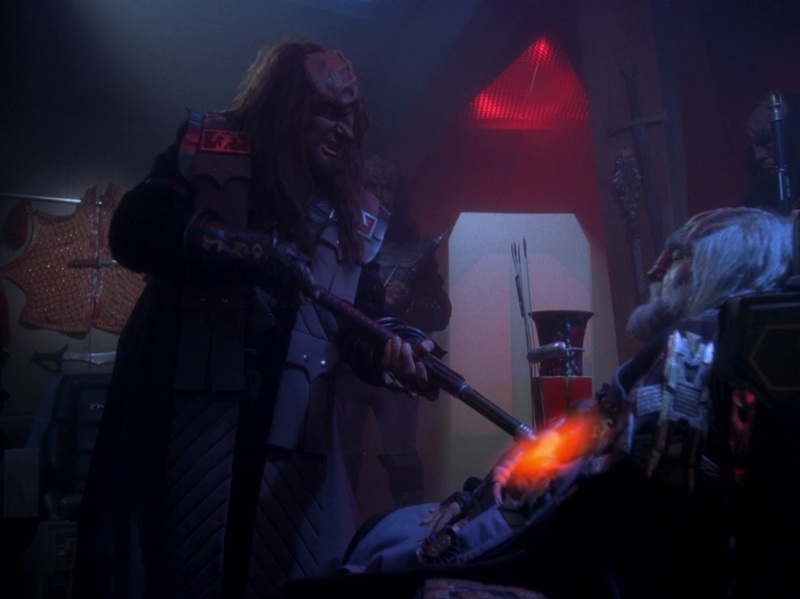 Crusher finds brain damage which has stopped Troi's empathic abilities. Crusher suggests Troi needs counselling and Troi gets grumpy about it. Riker offers to lend an ear and Troi angrily points out that people treat the afflicted differently. 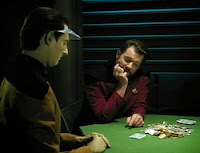 Meanwhile Geordi and Data tap consoles and realise that the ship is surrounded by 2D stuff that's not been seen before. 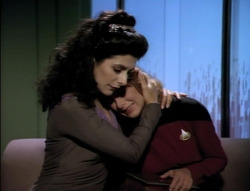 Troi tells her widowed patient that she's lost her empathy. The widow spent a night crying and says she feels much better. Troi tries to point out that that's not how it works, but her patient says she's wrong and Troi can't sense her feelings so she believes her. Data and Geordi explain that 2D things (possibly lifeforms) are dragging the ship along in a cluster. 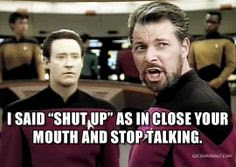 Troi takes it personally when Geordi says it's a shame they can't tell if the 2D things are sentient. Troi tells Crusher she can't work any more, ignores Crusher's reassurance and accuses her of neglecting her medically. 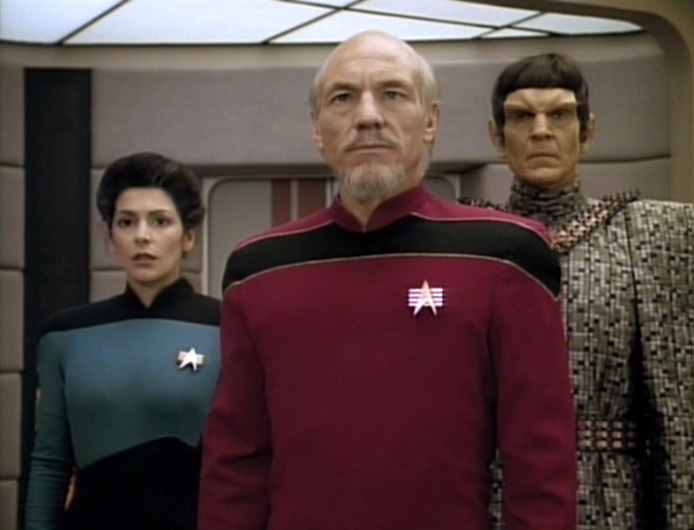 Troi tells Picard she wants to resign because she can't do her job and Picard tries to reassure her but she shuts down his inspirational-disabled-person story. Riker visits Troi and comforts her a bit, but when she gets angry with him he points out that she's just on equal footing with everyone else now. Further attempts to escape the 2D things don't work and make the ship shake. 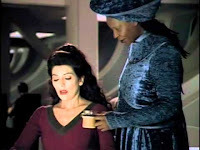 Guinan talks to Troi in 10 Forward, says she want to apply for vacant Counsellor post because it's like being a bartender. Troi points out why it's different before seeing what Guinan is doing. 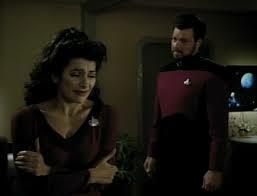 Troi explains that the strength of the 2D things' emotions was so strong she got short-circuited. She apologises to Crusher, who says therapists (and doctors) make the worst patients. 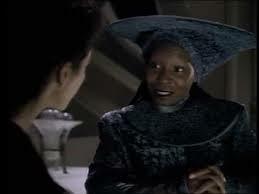 Guinan tells Troi she was just being human and asks if Counsellor's job is still free. 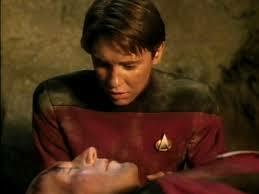 Riker tries to offer support to Deanna and keeps talking to her even after he is rebuffed. 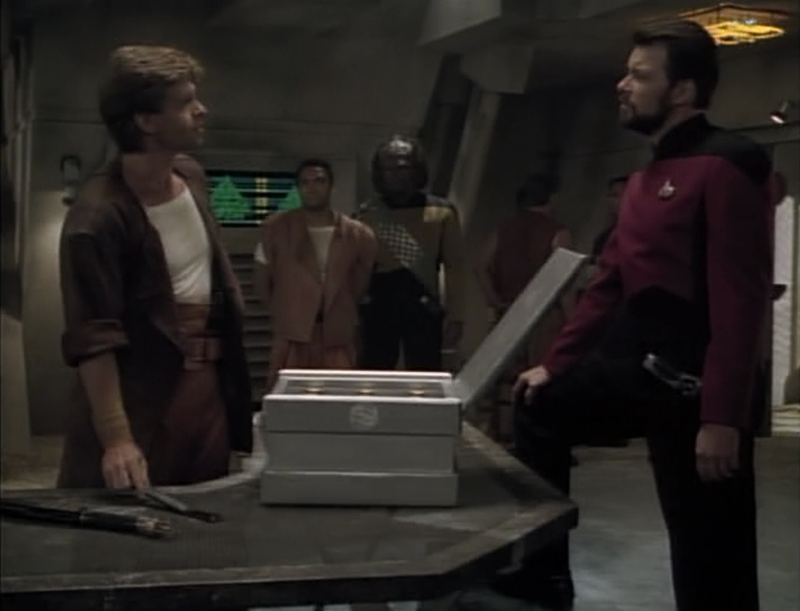 I suspect that their closeness is partly why Deanna lashes out at Riker so early. In some respects it can be easier to do that with people who are close, especially in a setting where she has to keep a professional relationship with most people. 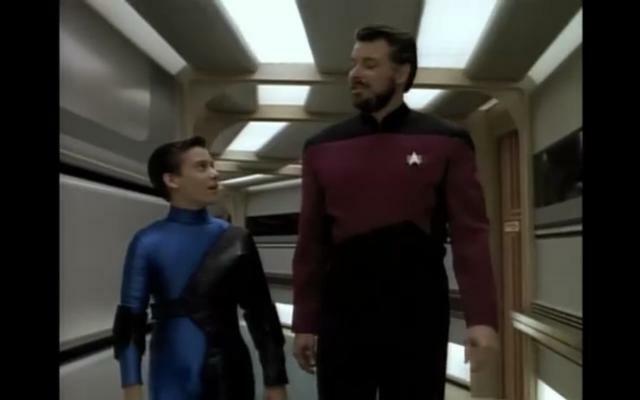 Plus I could understand that she fears and/or resents a change in attitude from Riker more than from others. When he later accuses her of being biased towards her Betazed (Betazoid?) half I'm not sure whether he's exercising some tough love or just getting pissed off at her. I mean she called him out about walking on eggshells around her, so is he doing the opposite on purpose? Alternatively, from the way he talks about the advantages her empathy gives her, I could see this being something that he actually thinks and maybe something that has bothered him in the past. 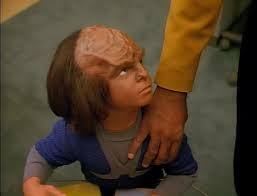 Either way, when Troi gets upset he offers a shoulder (or should that be chest) to cry on. This episode is trying to explore some important things and I feel unqualified to comment on how well it does that. I'm sure that I've been guilty of some of the ableist stuff mentioned here, and though I try to be aware and do better I don't have personally useful insight into these issues. I suspect this could be something that some people find helpful and others don't. If anyone has important stuff to raise on this I welcome feedback in the comments, for now I'm just saying what I've noticed. 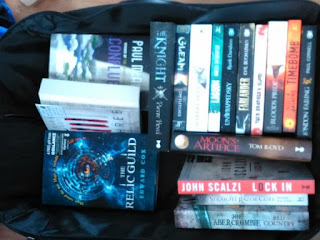 I'm going to split this section because I generally aim to keep these posts light, but there is heavier stuff to say. The Frivolous Bit: This is the most time Deanna has spent in her office in any episode. It's good to have an episode focusing on her career and professional standing. 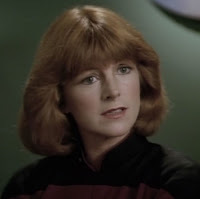 I joke about her moonlighting as Picard's PA, but when we see her she's usually sitting next to him on the Bridge, a place I suspect most Counsellors don't spend a lot of time. 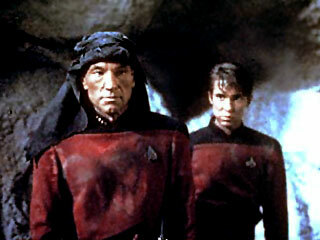 Picard even mentions that he's advantaged by having an empathic Counsellor. I get the feeling that Deanna has been relying pretty heavily on her empathy to do her job. Obviously she's trained in psychology, so even without her empathy she understands people's reactions, but because she can't feel it she doubts herself. Of course her advantage helps her to help people so that's good, but at least we see she's got knowledge and skills to back that up. While it's odd that Troi is being grumpy and defensive I almost feel like the tension could be heightened. If you suddenly felt like everyone around you was less real wouldn't you be more unpleasant to them? (Isn't that a problem with the internet?) Though this is TNG and it is not a show that enjoys sass or strength of (negative) feeling, so snapping at your friends is probably about right. 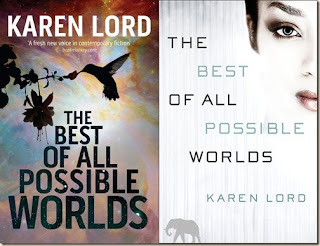 The Serious Bit: I think this is an exploration of ableism and how people without disabilities try to make things better for themselves at the expense of the disabled. Troi has some good points about how able-bodied/neurotypical people can treat the disabled differently and she does call out some crap in this area. 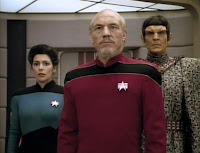 Picard's placating crap about how disabled people can find compensations for their condition, or else make super inspiring anecdotes needed to be countered. 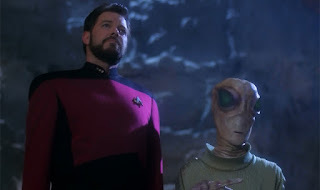 Though since Picard mentions blind people I'm kind of surprised Geordi doesn't feature more in this plotline, seems like he would have a useful perspective. I think this episode is also showing how distressing suffering a loss like this can be. 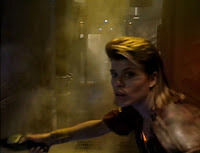 It is clear all the way through that Deanna has lost her self-confidence, and she's experiencing fear as well as anger. The word disability is used by Deanna and her situation is described like the loss of a physical ability, but it could be seen as an analogy for mental health problems too. Having said this I get a feeling that there are some ways in which this episode is not great in its handling of these themes. The main one is that Deanna is magically cured before the end of the episode, even her intense headaches are only at the beginning. While her fear over spending the rest of her life in what she sees as a diminished state is very real and powerful, she's suddenly fine so there's no real repercussions. Given the episodic nature of the show I think it's clear that this would happen, which does rather undercut the message. Phew, thank goodness that's over, no need for more character development! I have seen people angered by characters getting 'miracle cures' on more serialised and serious TV shows (Matthew's magic spine from Downton Abbey leaps to mind). It's like TV shows want to include disability (which is good), but only to the point that it isn't inconvenient (which is bad). Witnessing long term disability -especially one that causes ongoing pain- would be such a drag after all, let's just chat about it and leave it at that. 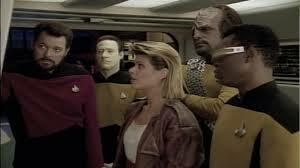 The other thing that occurred to me is that Riker might be right about Deanna's attitude towards humans. I certainly don't think it's conscious and she's never condescending to anyone about it, but this episode does make it clear that living as all humans do is unacceptable to her. I hope this doesn't seem like I'm making light of the exploration of disability here, but I do feel that another way of reading of this episode is that it's about someone losing a privilege. Deanna has an advantage over others that helps in her work and her life, and of course it's distressing to lose that, but all it does is put her on an equal footing with everyone else. I don't think that this was entirely intended by the writers, it's not explored much, but I think it is a way of looking at what's happening here. While being a counsellor is definitely different to being a bartender, I do think that Guinan could totally do it (not any bartender mind, Guinan). She describes herself as coming from a race of listeners, and she is often able to get people thinking about themselves/their situation in a different way. Like how she does it here, with the counsellor. 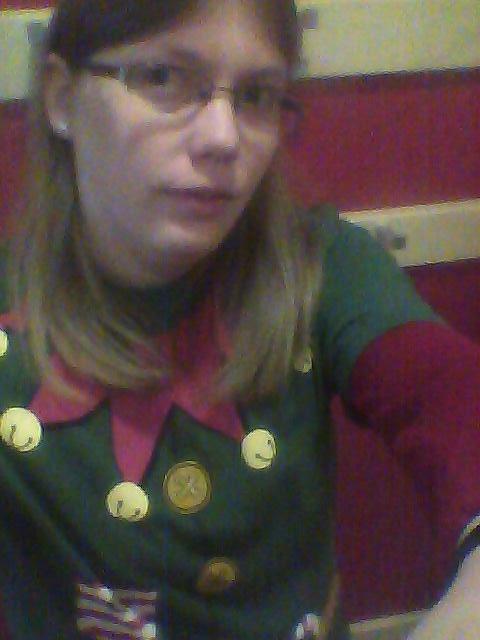 Also she's amazing! 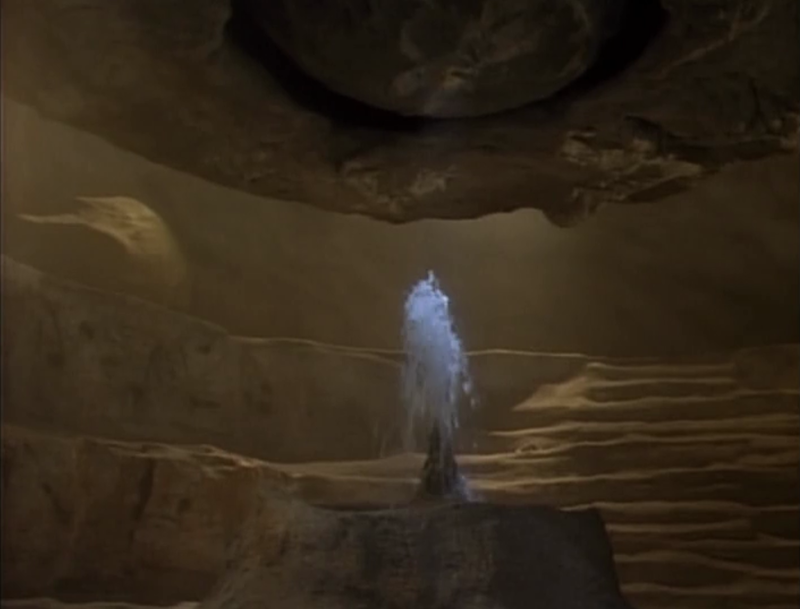 I mean she can sense when Q's coming (which Troi can't). 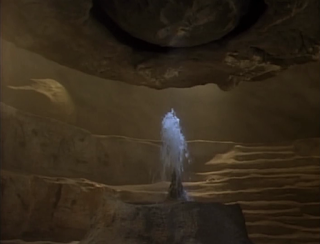 While her powers are less well-defined than even Troi's nebulous empathy (which at least has a name), I'm pretty sure she's like a Time Lord-Jedi so that's cool. Troi talks to Ensign Brooks, it's partly about her husband's death, but mostly about the Ensign's feelings and how she's coping. This is Troi doing the job that she loves and helping someone. 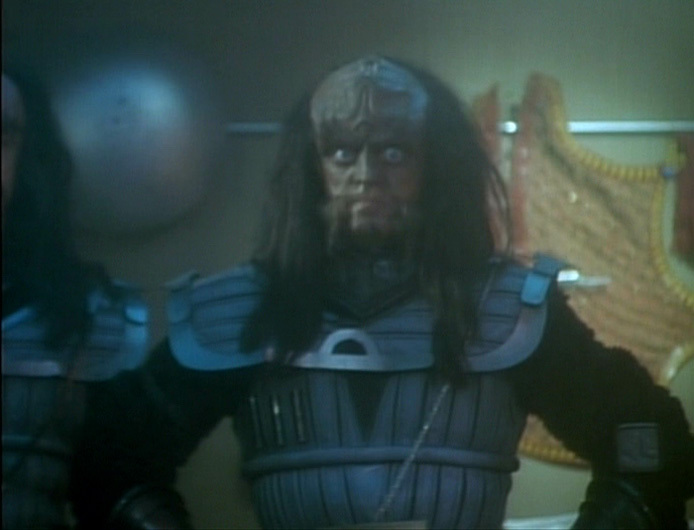 Troi talks to Crusher about her health and even though they're friends Crusher doesn't baulk at giving bad news. 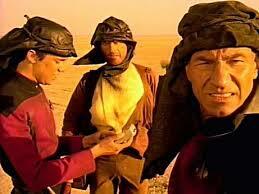 It's a mix of professionalism and care and Crusher displays a lot of tolerance for Troi's reactions. Guinan discusses the counsellor's role with Troi in what seems to be a discussion about Guinan's career aspirations, but is really a way of getting Troi to realise her abilities. I think this episode has about 6 different scenes that pass the Bechdel-Wallace Test, with 4 different women! (The Test is actually a low bar and not by any means a gold standard, it's just presented that way because so few things even achieve the low bar.) That seems like tonnes compared to most episodes of this show (or indeed episodes of many things that are on TV even 25 years later). This was done simply by having the A-plot focus on a woman and having some of the other people she interacts with also be women, it's not tricky. 1. Senior staff are called (and we actually hear the announcement in this episode). 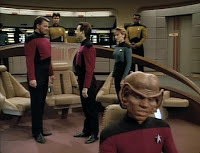 They discuss the fact that the ship is being pulled along by something they can't sense. Troi realises she's lost her empathic abilities. 2. Geordi and Data explain about 2D things, which couldn't be detected by sensors before because they were looking at them along their edge, in the dimension they don't have. 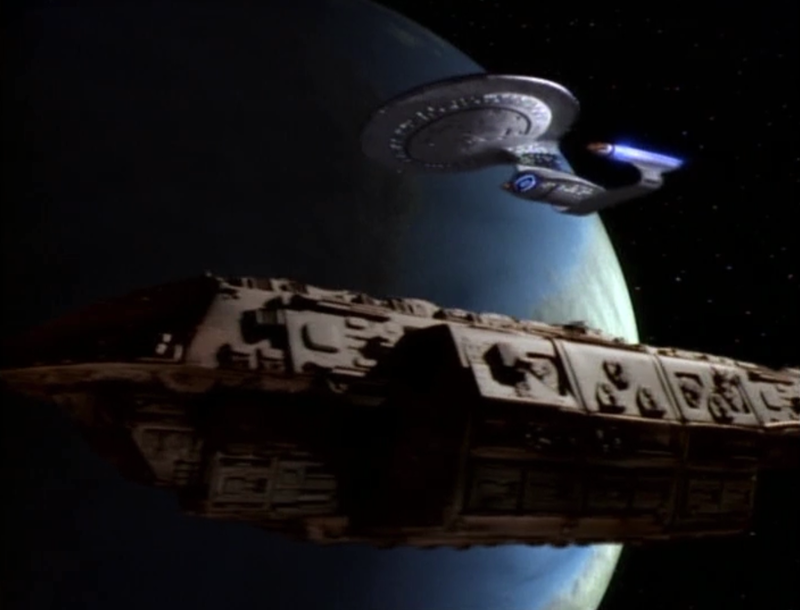 The ship is trapped in a cluster of what could be lifeforms because of gravity or fields or something. No one is sure if the 2D things know the ship is there. 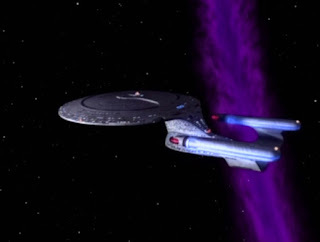 Troi takes speculation about the situation as a comment on her current failings -which is not how it was intended- and storms out. 3. 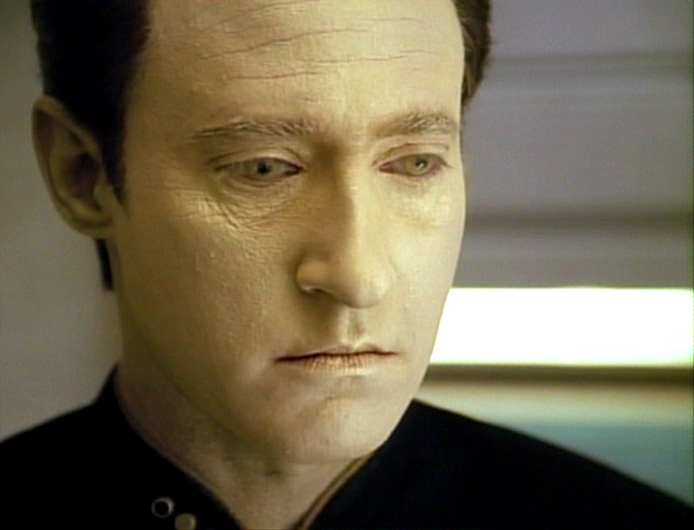 Picard calls Troi and asks her to help Data, she takes a bit of convincing but Picard points out that even if she can't sense what's going on she still has psychological insights which may well help. Ensign Brook's husband died in an accident. The details aren't specified, but clearly this kind of thing happens in space. It's interesting that it's all about her grief and how she's dealing with that. It's the emotional reaction of the woman not the death of her husband that's important. 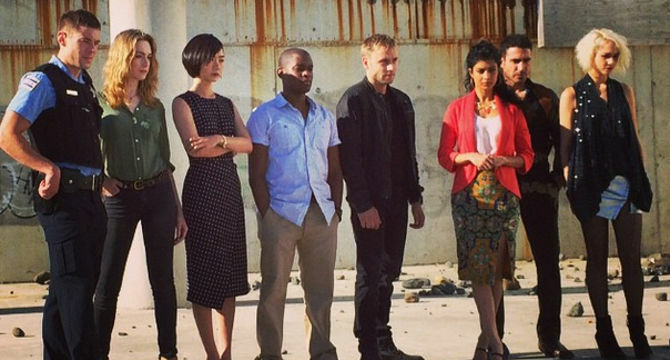 It's counter to certain common Hollywood tropes, being about feelings not action or vengeance. 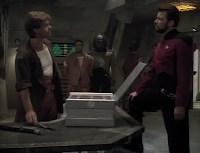 The episode ends with a bit of banter between Riker and Troi, and a moment where it looks like they might kiss, though it might have been a joke. What's going on with these guys?